Lori (aka LoMo) traveled on down from Alaska to attend Ukulele University and then hung out for a few extra days! Late nights playing uke, bar-hopping during Happy Hour, and floating the Deschutes River filled our time. Even though the weather was warm, we hiked (she dragged me) up Pilot Butte, and we never ran out of things to talk about. Out of the Sugar Daddy Beer. She made me breakfast! Leftover taco fixings with a fried egg. We floated the Deschutes River three times. What a nice time! Of course, we stopped in at Dakine Grindz for a shaved ice after one of the floats. Next up: book edits, photo project, keep Yam awake during the day, and chores. And, back to the diet! I splurged for three weeks. Mmmmmm ... chocolate zucchini cake! Our second annual Ukulele University was this past weekend. What a blast! The event went well, and my friend, Lori from Alaska came down for it. I conquered my fear of stage fright and signed up for open mic. A few of us have been working on learning "Roxy's Waltz," so we played it for everyone. During one of the workshops, we also learned to play "Little Darlin" by The Diamonds. The workshop leaders, The Refreshments, invited us up to play with them. Video coming soon! Emil recorded it. Me! Introducing "Roxy's Waltz" for open mic. Nicole and Aaron Keim. Love them. Love them. Love them. Overall, it was a fantastic event! Quite warm, but plenty of shade and water. Looking forward to next year! If you want to see more pics of the event, like the Ukulele University Facebook page. I've posted tons of pics there. Next posting: pics from Lori's visit. Many floats down the river, shaved ice, and breweries. A fun-filled last day with the family. I'm very sad to see them leave. But, hopefully they will enjoy cooler weather at the Oregon Coast and enjoy some local wineries. We spent most of the day at the Oregon High Desert Classic. So cool! Nice viewing area under tents. The grounds were spectacular - green grass, no dust, vendors, stables with fans. Impressive! We did see one rider fall at a jump. Scary! And a few horses refused a jump. We waited until the hottest day to float the Deschutes River. Even though it was quite warm, and we acclimated to the water temp, we still shivered just a little bit. Saw a river otter, girls in bikinis (Tom!! ), folks on every imaginable floatie, and beautiful houses. Thanks to Emil for the drop off and pick up! 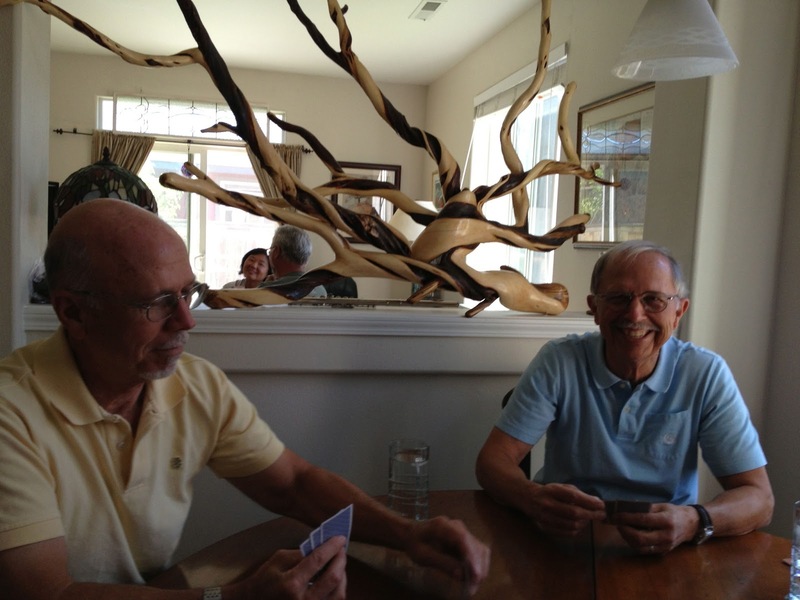 Uncle Ron and Dad. Almost twins! Nice float tube. Where's your rod and reel? Holding on to each other's floaties. Emil waited on the bridge for us. Now, it's time to de-cat the house before Lori flies in tonight. She's allergic to cats. Guess we'll have to spend all our time at Ukulele University, the breweries, and floating the river during her visit. 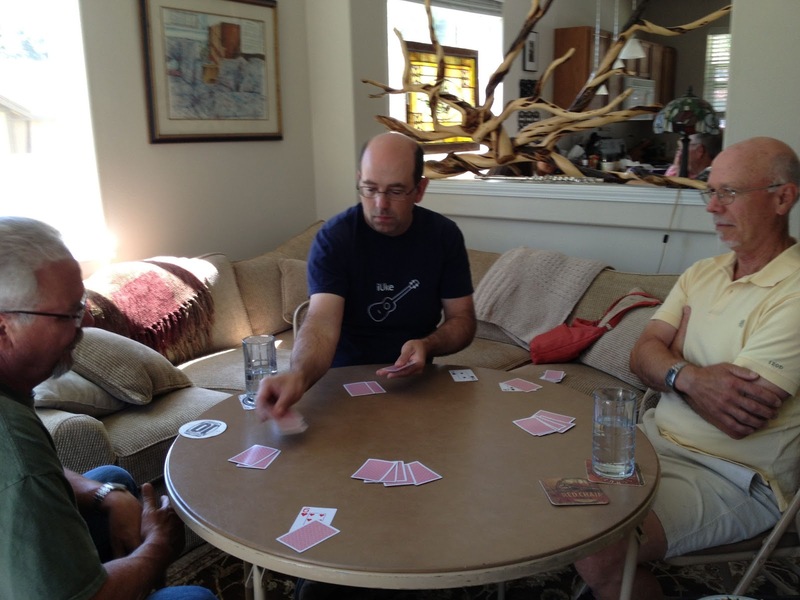 Euchre, Mexican Train Dominoes, Ukulele jam, and more. There's still one more day left in their epic visit to Central Oregon. Fingers crossed for a hot, sunny day, and you'll see us with floaties on the Deschutes River. Euchre - my second favorite card game. 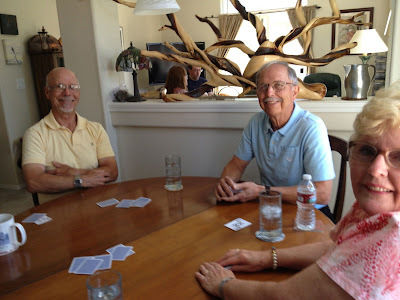 Seasoned Euchre players, Don, and Glencora. Nora, our wonderful host! And, she hails from Cincy! Our uke playing didn't scare them away. Yet. Uncle Ron tried out the bucket bass. Mexican Train Dominoes with the neighbors. Check out that gorgeous view! If you need house-sitters a few years from now, my family is glad to take care of your critters and home. It really worked out well for them to house-sit and visit us. Thank you so much for Ron and Carrie for opening their home to us, once again! Okay, looking at my handy spreadsheet, they didn't have time for the following activities: Benham Falls, Smith Rock, walk the river trail, Oregon Country Fair, Crater Lake, Steelhead Falls, alpaca farm, kite flying in the field, walk around downtown Bend, Tumalo Fall, Deschutes Brewery Tour, stand up paddleboard, Farmers Market downtown, mountain biking at Phil's Trail, Munch and Music, free concert at Les Schwab, watch the triathlon at Old Mill, hike Pilot Butte (Uncle Ron did), and eat at 10 Barrel. Guess we'll have to do all that next time. We're still having fun! Our days are filled to the brim, but the nights are relaxed, watching the sunset. Friday, we spent the day at the Old Mill area. I love seeing everyone float down the Deschutes River via stand up paddleboard, floatie, air mattress, and more. We had a lovely lunch at Jackson's Corner, drove around Northwest Crossing (hi to all my friends who live there), and cooked dinner together at my house. Saturday, Mother and Dad drove a 100 mile loop, while Uncle Ron and I had grand adventures. The pictures really tell the story. Trying out one of the bikes. Captain Jack Sparrow. Looks different, but still tastes darn good. The BEST shaved ice on the planet. Seriously. Uncle Ron and I shared one, twice in two days. Hanging with pals at Elk Lake. Hi Nora! 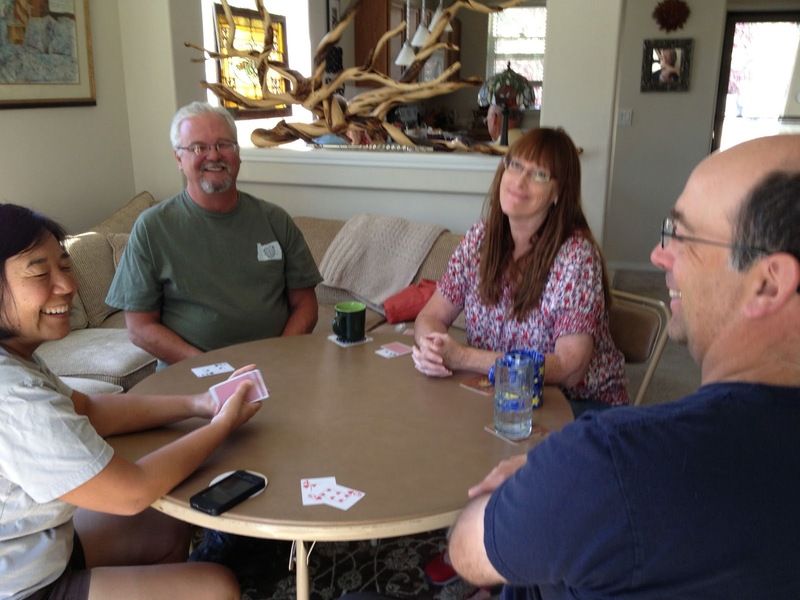 Playing Euchre at Elk Lake. A quick trip down to the lake before heading to the next place. Dillon Falls. A must see. Yesterday, was a super warm day! Brunch at McKay Cottage, a quick stop at the summer festival downtown, and a shaved ice. As I was checking my spreadsheet, I saw there are many more must-do activities. Just a few more days to cram them in. Equestrian event, float the Deschutes River, Euchre with friends, ukulele jam, Smith Rock, and hiking the Deschutes River Trail. After the family departs, LoMo flies in for the ukulele festival. Wahooey! We'll also partake of a few more breweries we didn't visit on her last trip.